The Fashion Update brings you pictures and news about clothes I’ve spotted and coveted at various shops around Melbourne. I hate reading about fab clothes in magazines that won’t be in stores for months, or I have to phone a Stockist to find it… This way, I’ll bring you ‘on-the-spot’ snaps of fave fashion, tell you where you can buy it, the label, the price and phone number/address for the store it’s from. So if you DO want to snap it up, you can do so immediately. Here’s what I found today at the Rock Shop in Church Street, Brighton. It’s a store that lives up to its name – rocking it with a great range of funky dresses from a variety of independent, smaller local designers. The price tags are pretty reasonable too, which makes it even more appealing. (1) Just because it’s might be winter, doesn’t mean you have to wear black ALL the time. 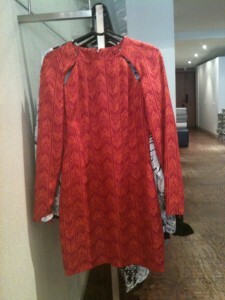 I love a splash of colour when the skies are grey and this Bec and Bridge dress will definitely lighten your mood. 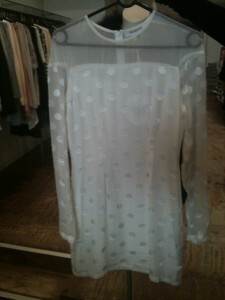 (2) Or you can opt for winter white polka dots in a Maurie and Eve number. It’s a little on the short side, but if you’re blessed with a great set of pins, go for it! (3) Heading into the evening, you’d find it hard to go wrong in this Shakuhachi leather contrast shift. It’s a bit tricky to see from the photo, but the bottom part of the dress if leather – hence a slightly higher price tag. A great cut plus a bit of sparkle. Nice. The Rock Shop is located at 93 Church Street, Brighton.